Leo Da Silva Lopes is congratulated by Posh team-mates for his part in the opening goal against Plymouth. Photo: Joe Dent/theposh.com. Peterborough United opened the League One season with a controversial 2-1 win over Plymouth at the ABAX Stadium (August 5). Goals at the start of each half from visiting defender Gary Sawyer and Junior Morias proved decisive. The visitors replied through substitute Gregg Wylde 20 minutes from time, but Posh held on in an occasionally frantic finale to claim three points. Junior Morias scores the second Posh goal against Plymouth. Photo: Joe Dent/theposh.com. Referee John Busby was booed off by the visiting fans who believed, with some justification, that Jack Marriott had fouled centre-back Sonny Bradley before setting up what turned out to be a crucial goal for Morias. Goalkeeper Jonathan Bond was the Posh man-of-the-match which proved how unlucky the visitors were to leave pointless, although Plymouth ‘keeper Luke McCormack made two brilliant second-half stops to deny Marriott and Michael Doughty. 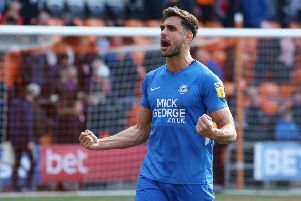 Posh have promised many goals this season and it took them just four minutes to get the first of the 110 predicted by chairman Darragh MacAnthony. It was a fluke mind as a cross by Leo Da Silva Lopes, after some decent trickery from Marcus Maddison, was deflected into his own net by Sawyer despite the best efforts of goalkeeper McCormick. Almost immediately Marriott glanced a close-range header straight at McCormick, but the early advantage didn’t lead to a dominant performance. Indeed visiting centre-back Ryan Edwards should have scored before Sawyer, but headed wide from six yards from a corner. Plymouth enjoyed plenty of possession, but goal-scoring was an issue for them in League Two at times last season and they weren’t helped by the early departure through injury of centre forward Ryan Taylor. That meant the redeployment of Jake Jervis into a central role which probably pleased Ryan Tafazolli as one of two centre-backs expected to cover wide areas in the absence of wing-backs pushed up high. Jervis did a chance to strike, but flicked the ball over the bar from close range after a corner was nodded back across goal. As expected Posh went with their 3-4-1-2 formation and looked solid defensively after a sketchy opening 10 minutes, until Plymouth playmaker Graham Carey started to play. It was his clever pass which forced new Posh ‘keeper Jonathan Bond to save brilliantly from Joel Grant and Antoni Sarcevic, one straight after the other. Marriott’s square pass enabled Morias to strike on 47 minutes before Bond reacted superby to deny Jervis after Jack Baldwin had been robbed by Lionel Ainsworth. Bond also stretched well to thwart Wylde’s 20-yarder before Posh started to enjoy their best spell of the game. A quick break from a Plymouth corner led to Maddison teeing up Doughty who couldn’t find a way past McCormack and Maddison’s deep cross was then headed back across goal by Gwion Ewards, but McCormack appeared from nowhere to block Marriott’s strike at goal. Wylde scored on the breakway after Maddison had been tackled, but a few goalmouth scrambles later and Posh could celebrate victory. Posh have won their last six opening day home games in the Football League. An updated match report will appear online tomorrow at 7am (August 6). Posh: Jonathan Bond, Ryan Tafazolli, Jack Baldwin, Steven Taylor, Leo Da Silva Lopes (sub Alex Penny, 90 mins), Gwion Edwards, Anthony Grant, Michael Doughty, Marcus Maddison (sub Danny Lloyd, 81 mins), Jack Marriott, Junior Morias (sub Idris Kanu, 68 mins). Unused substitutes: Josh Tibbetts, Chris Forrester, Andrew Hughes, Callum Chettle. Plymouth: Luke McCormick, Gary Sawyer, Sonny Bradley, Oscar Threlkeld, Ryan Edwards, David Fox, Graham Carey, Antoni Sarcevic, Joel Grant (sub Gregg Wylde, 57 mins), Jake Jervis (sub Ruben Lameiras, 72 mins), Ryan Taylor (sub Lionel Ainsworth, 21 mins). Unused substitutes: Robbert Te Loeke, Gary Miller, Yann Songo’o, Aaron Taylor-Sinclair. Goals: Posh - Sawyer (own goal, 4 mins), Morias (47 mins). Plymouth - Wylde (77 mins). Cautions: Posh - Grant (foul). Plymouth - Carey (foul), Fox (foul).